Special Agent Frederick Louis Regan, accompanied by other agents, raided an illicit distillery hidden deep in the swamps near Elizabeth City, NC. As the raid unfolded, various suspects ran off in different directions. Agent Regan pursued one suspect through the swamp and eventually captured him. Shortly thereafter, he suffered severe chest pains. In order to obtain medical attention, Agent Regan had to walk a considerable distance out of the swamp where he was taken to Elizabeth City hospital. Agent Regan died later that same day. 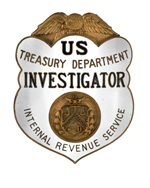 Agent Regan joined the Alcohol Tax Unit on December 30, 1940, and served in offices at Charlotte and Elizabeth City, NC. He carried badge #807. Previously, he had been a detective with the Boston Police Department for eight years. He was a proud veteran of the U.S. Navy. Agent Regan was born in South Boston, MA. He was survived by his wife, Helen.